Cameron Carter and Michael Spence AC signing the agreement. 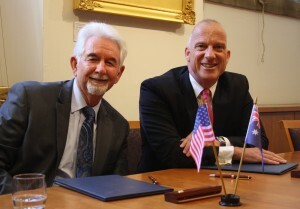 A new agreement between the University of Sydney and the University of California, Davis will see academics benefit from new access to research collaborations and shared funding. In February, leaders from both institutions joined a partnership signing event. Vice-Chancellor for Research Professor Cameron Carter of UC Davis and Vice-Chancellor and Principal Michael Spence AC both highlighted the fact that UC Davis has research expertise which greatly complements areas of research strength at Sydney. “We are very excited about this partnership agreement, particularly for the areas of agriculture and veterinary science,” Spence said. Veterinary Science is a strong research field for both institutions: in the 2016 QS World University Rankings, UC Davis was ranked first in the world for the subject area, with Sydney University ranked ninth. “There is also potential for collaboration in new areas such as neuroscience, life sciences, public health, and food security and safety,” Pro-Vice-Chancellor (Global Engagement) Katherine Belov said. Under the partnership agreement, which follows many years of active academic collaboration between the two bodies, both institutions will contribute up to $100,000 annually for two years to support cooperative research projects and activities. The new partnership is the second signed since the release of the University of Sydney’s 2016-20 Strategic Plan. The first agreement under the new strategy was signed with Hong Kong University last year.